In turn-of-the-century America, teams of “Bloomer Girls” traveled across the country challenging men’s amateur, semi-pro, and professional baseball teams to exhibition games. Despite being nicknamed for the loose-fitting trousers that they wore on the diamond, Bloomer Girls were tough competitors. One such “Bloomer Girls” team arrived in Joplin in June 1898, to play a series of seven baseball games against McCloskey’s Giants at Cycle Park. Interest was so intense that promoters added additional seats in anticipation of large crowds of spectators. Maud Nelson, star pitcher for the team, was hailed as “a twirler of exceptional speed, and it is a common occurrence for her to strike out the strongest batters on the opposing team.” Nelson, a native of Chicago whose real name was Clementina Brida, grew up playing baseball with her brother. As a pitcher, she was reportedly paid $250 a month. 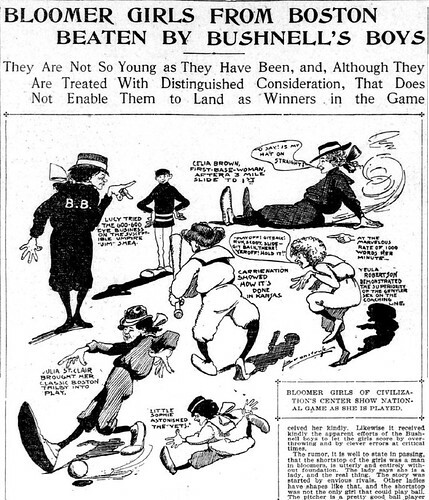 A 1901 cartoon of the Bloomer Girls from the San Francisco Call. When the Bloomer Girls played McCloskey’s Giants at Cycle Park, they faced fierce competition from the Giants, who played as if “they had reputations to lose.” Managers McCloskey and Menefee livened up the game by having their men run between bases with the Bloomer Girls in hot pursuit. Unfortunately for the Bloomer Girls, they lost the first game 14 to 1. Maud Nelson, who was “justly” billed as the “star of the team,” continued to be involved in baseball for years to come as a manager and team owner, anticipating the time when the women of the All-American Girls Professional Baseball League. Sources: The Joplin Globe, the Library of Congress, www.Exploratorium.edu, Wikipedia: Maud Nelson. I’m seeking information for a new book. Can you tell me if anyone knows just when (exact date) that the Bloomer Girls came to play in Cycle Park? All Missourians are pulling for the Joplin survivors. Some local retired teachers are donating my books to the most damaged schools. Thanks in advance for any help.